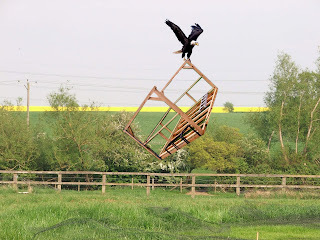 Assisted by Adrian, freshly released from MK College, a considerable amount of cake, chipsticks and sherbet was consumed in and around the paddock, interrupted by a strange version of boules and searches for lost tennis balls. Teenager #1 ate most of the sherbet and my supply of fiery seeds and was quite nice all day to Teenager #2 whose birthday it was. Finally Peter's oak gazebo, with railings by Gemma, is complete. Today also saw the completion of a bigger canvas version. Things are looking good for Saturday! Found this in one of my boxes that I have been tidying up over the holiday. It was my brother's. Well, still is I suppose. It must be 60 years old now - but I'm sure it'll still work. I did warn you that there'd be some odd posts! "Can you use it as a ruler too?" asked Kirri. Admittedly, that was before he'd seen what a slide rule actually looked like. I even have the original case and instructions. This one looked right, then left . . . (OK, it's not a road, I know, but threshold probably wouldn't have got your attention). Incidentally, if you view these two photos in the slideshow and go back and forth between them it's a giggle!. Finally, the roof's complete. Now for the floor. The decking had been deposited (along with three massive bags of stones) by the suppliers in the drive, preventing anyone from getting out and Pete was nowhere in sight so Graeme, Maggie and I had to move it all. Quite how all this will be finished by this time next week I have no idea. Watch this space, I suppose! Of roof his dad has done. I came across this comic when tidying up some boxes of my old friend Vincent's stuff. Now you'd expect a giggle as it is a comic but probably now, 73 years later, for quite different reasons!! For younger readers, 2d, or tuppence, is a bit less than 1p in today's money. 2/6 stands for 2 shillings and 6 pence, or half a crown as we'd have said then, which is 12½p. I can remember my father calling people's faces physogs but I'd never seen the word in print and thought he'd made it up until now! Click any illustration for a full-size version and have a chuckle as you read! I guess this ticket wasn't a winner. A shilling would have been quite a high price to pay then. What appeals to me is how these have been specially printed - there surely can't have been that many staff in the General Manager's Office! The diaries have been pretty sparse in their content for a couple of years but the entry on Sunday 26 January 1919, meeting the Archbishop of Cyprus at 11am, is fascinating as he was over here on a political mission at the time to pursue his island's independence. Vincent in his Church role would have been organising something behind the scenes. Graeme blames a giraffe for some interesting variations in beam lengths. 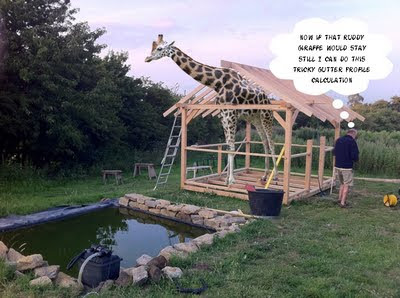 Now, most people would, you'd think, wonder why on earth there should be a giraffe in Astcote in the first place. "Ah, just the right back angle to hold up the roof!" said Pete, always keen to use natural solutions. The Paddock Party Committee met in Cold Higham where Adrian entertained us and Sarah B fell asleep after providing masses of fine food and drink, including some remarkable desserts from the Saladeers. Stationmaster Steve demonstrated yet another skill by the production of Stationmaster's Light Ale, a tipple that had the Chairman wanting more and making several trips around the table after several handfuls of Bombay Mix. In the absence of a Paddock Party this year there was not a great deal to report which was just as well seeing as how the Minutes Secretary had to interrupt proceedings in order to watch his 12 year old son emerge from a Village Hall Disco, thankfully sober and not wrapped around several female school friends, in Potterspury and then do the Dad Taxi service before returning to the Committee. On his return half the Committee had disappeared, possibly to avoid having to sing his reworked version of Under The Boardwalk. So that they might practise for the next occasion the lyrics are included below. with apologies to The Drifters and The Rolling Stones, amongst others. A downpour this evening didn't seem to bother this visitor. Now that the pond looks like a pond should look again, I can see that I'm going to have trouble next time I have to put the geese away before they're ready to go on their own! I was just taking a quick snap of this jackdaw, who'd been showing off his ability to stand on one leg and stare at me, when there was a strange wooooo-ooo noise from across the road. Now, normally I would have associated that kind of noise with either an owl or one of Stationmaster Steve's latest steam engines blasting its way around his plum tree. It was neither. A large ghost had appeared in his garden.